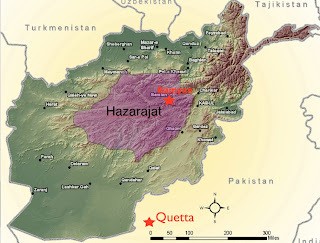 The restive Hazara region of Pakistan is not inhabited by the Hazara people, whose homeland, Hazarajat, lies instead in central Afghanistan. But the Hindkowans of Hazara and the Hazara of Hazarajat face some similar issues. Both have tense and sometime violent relations with the Pashtun people who live between them. And in both areas, development officials are hoping against great odds to develop a tourism industry, based in part on the legacy of ancient Gandhara. Hazarajat, covering the rugged center of Afghanistan (see map), is distinctive in several regards. Although Afghanistan is in general a strongly Sunni Muslim country, the Hazaras are almost all Shiites. Reputed to be the descendants of medieval Mongol invaders, they tend to have an East Asian physical appearance. Genetic analysis shows mixed ancestry but also reveals an extremely high prevalence of the Y-chromosome attributed to Genghis Khan. Legends of descent from famous individuals evidently sometimes have merit. Owing largely to their Shiite faith, the Hazaras have suffered several bouts of oppression. In the late 1800s, the “Iron Emir” of Afghanistan, Abdur Rahman, slaughtered many and economically exploited the survivors. Through the twentieth century, Hazarajat remained one of the poorest regions of Afghanistan. Under Taliban rule in the late 1990s, Hazaras were again bullied and suffered more than one massacre. According to Hazara leaders, such events verged on genocide. The condition of the Hazaras has improved in recent years. Hazarajat is now relatively secure, although occasional attacks still occur. More than any other ethnic group of Afghanistan, the Hazaras have embraced modern education — for girls as well as boys. As the New York Timesreported in January 2010, “Two Hazara-dominated provinces have the highest passing rates on admissions exams for the country’s top rung of universities. … In the high school graduating class of 2008, three-fourths of students in Daykondi who took the test passed, and two-thirds in Bamian, compared with the national rate of 22 percent.” Such figures are of concern to Pashtun leaders, who fear that the Hazaras may come to wield disproportionate influence on Afghan national life. Concerns about Iranian sway in Hazarajat are also widespread in Afghan Sunni communities. Current Hazara security concerns are not focused locally, but rather on Quetta Pakistan, a reputed base of the Taliban command. Hazara migration to the Quetta area dates back to the 1800s. During Taliban times, migration accelerated. An estimated 500,000 Hazaras live in Pakistan, mostly in the Quetta area. According to the Hazara Nation website, over 400 Hazaras have been killed and more than 1,000 wounded “in different incidents of targeted killings, bomb blasts, rocket attacks, vehicle snatching and robbery attempts in Quetta over the past two years.” On March 21, 2010, the Hazara Democratic Party carried out a large demonstration in Quetta to protest the killing – and the feeble response to such crimes by city officials and law-enforcement agencies. At home, Hazara officials are hoping to nurture a tourism industry. Located within the greater Gandhara region, Hazarajat’s ancient ruins are impressive. They were far more impressive before the Taliban obliterated the massive statues of the Buddha in Bamyan in 2001. Before the Soviet invasion of Afghanistan in 1979, up to 64,000 tourists a year visited Bamyan. Last year, only 800 foreigners came; most were temporary residents of Afghanistan. Local officials hope that improved security will allow the renewal of tourism. Their website touts not only the remains of Gandhara, but also Afghanistan’s only national park. Future ski resorts on local mountain slopes are also being discussed. Bamyan has an official ecotourism program, backed by the government of New Zealand and the Aga Khan Foundation. Officials hope that Bamyan will have 1,000 tourist beds by 2015.